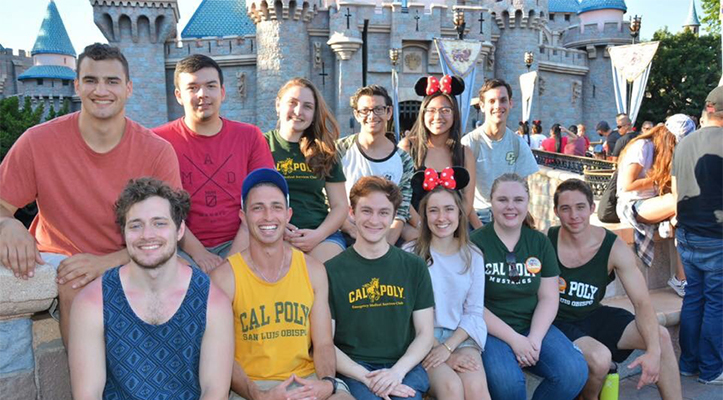 The Cal Poly Economics Society club went down to Disneyland on a scholarship for their research project on May 19th. The goal of the project was to create a model for what students will be setting up for senior projects and class assignments by collaborating with grad students in coding preference functions for the attractions Disney has to offer. The main objective was to estimate the preferences of Cal Poly students regarding Disneyland rides by distributing a survey and then analyzing the results through a coding system called “R”. In essence, a way to measure and single out a student’s utility was being sought- utility being the economic term for happiness. The rides that provide the highest utility will be the most preferred rides, while the rides with the lowest utility will be the least preferred. Through discovering which rides provide the most utility for students, theoretically the club could advise students on exactly which rides they should go on to maximize their utility, given varying wait times at Disneyland. The results were both instructive and interesting. For example, both men and women would be willing to wait up to 50 minutes to ride Space Mountain, but would need the wait to be only 11 minutes for Buzz Lightyear to make them indifferent. The attraction It’s A Small World could actually decrease someone’s enjoyment of their experience in the park, portraying how the project results could advise Disneyland itself. Providing Disneyland with information on the preferences for rides could help them make improvements which would enhance students’ overall experience and therefore attract more students to return frequently. The project was chosen namely to bring insight into what are the inputs and set up of designing surveys, how to utilize data analytics and interdisciplinary skills for data mining and how to see an idea from start to finish while expanding upon the possible real-world applications. This project emboldened students in their familiarity with senior-project quality research, writing, and work loads through the Learn By Doing Cal Poly model. It was rewarding to both participate in the project and travel to Disneyland for some first-hand appreciation. The club is excited by their findings and hopes to continue to use this project as a base for further experiments in the coming years.